A pilonidal cyst is an abnormal pocket in the skin that generally contains hair and skin debris. A pilonidal cyst is found near the tailbone at the top of the natal cleft of the buttock. Pain, swelling, and redness in the affected area around tailbone may be a sign of a pilonidal cyst infection. If the cyst becomes infected or is filled with pus, a doctor might be needed to drain the cyst, and still, there is a chance for the infection to come back again. 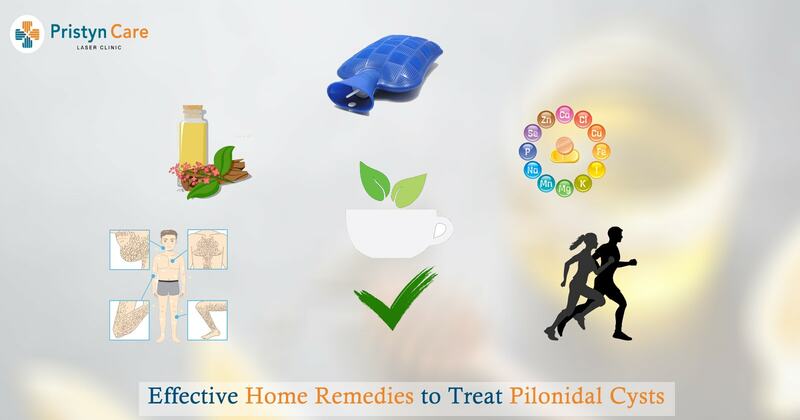 However, in the early stages, the infection or re-infection can be restricted with the help of some home remedies. A good hygiene decreases the chances of contracting an infection. Clean the area regularly with soap and water while showering. Let it dry completely before wearing clothes. Use mild products as any harsh chemical will irritate the skin. Since ingrown hair is the most common cause for a pilonidal cyst, keeping the area free of hair might help to control the infection. Essential oils like tea tree oil are very effective as antimicrobials and may be useful to prevent the infection of the cyst. Some other oils like jojoba oil can help in moisturizing and smoothening of the skin. Giving hot compress to the inflamed area might give some relief from the pain and inflammation. Sitting in a tub filled with warm water may also help with inflammation and decreases the chances of an abscess in the early stages of infection. Vitamin C and zinc supplements can help in the healing process. Vitamin A also helps in tissue repair. Consult a doctor for the right dose of these supplements. Regular exercise improves blood flow and helps in healing of pilonidal cyst.